Given the lack of any summary work on the traditional egg-decorating patterns of Sárköz, the sampling presented here relies exclusively on the collection currently housed at the Báta Country Home Museum (Bátai Tájház), which I hope will nevertheless offer a sufficiently comprehensive look at the motifs of the region. The range of patterns in question differs significantly from that of other regions; the motifs are highly distinctive, though displaying a marked similarity to those of Upper Torontál County in terms of component parts. 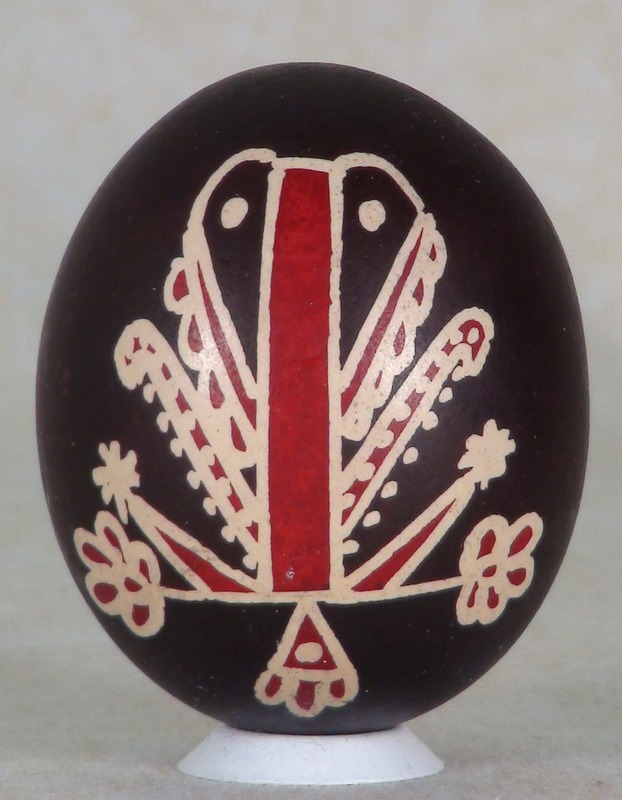 Traditionally, most eggs in Sárköz were produced by the local Catholic community using motifs that were predominantly floral, though birds, fish, crosses, and the national coat-of-arms were also known to feature in the mix. Sárköz eggs are decorated over their entire surfaces, any bare patches being covered in coloured dots (bagó). As regards use of colour, the spectrum was originally dominated by orange, red, and black; then, toward the end of the 1920s, green and purple were added to make the eggs more attractive for sale. In terms of technique, Sárköz eggs belong to the category made using the method known as “írás,” whereby designs are drawn on in wax and the result immersed in dye, though the colours purple and green, which were not traditional egg dyes, were applied using a brush. Although a number of different colours were used, the matter of which design might be painted on which colour egg was precisely defined. Though in my own work, I have attempted to remain faithful to these rules, in certain cases I have diverged from tradition in order to meet modern expectations. Another special feature of the Sárköz egg-decorating repertoire is its depiction of entire animals, a rare phenomenon within the art. Local patterns include an abundance of fish and bird motifs, interesting not only for their highly detailed execution, but also for the way in which flowers – mostly tulips – are made to sprout from the animals’ mouths (and even tails). Such images are not found elsewhere on painted eggs, though they do appear in other crafts, such as embroidery and horn carving. The logo for the popular animated series Hungarian Folk Tales, for example, includes such a motif. Given the detail and large number of colours involved, Sárköz egg-painting is a labour-intensive process that requires a greater time investment than is the case in any other region. Around the year 1900, Márton Balázs, considered the first major researcher of Háromszék traditional painted eggs, produced drawings of more than eight hundred egg patterns for the Székely National Museum. This material was taken up by Zoltán Kakas, who, as Balázs’s successor in the study of Háromszék eggcraft, engaged a number of local craftswomen to produce a partial representation of the collection, while also working to collect additional regional patterns. 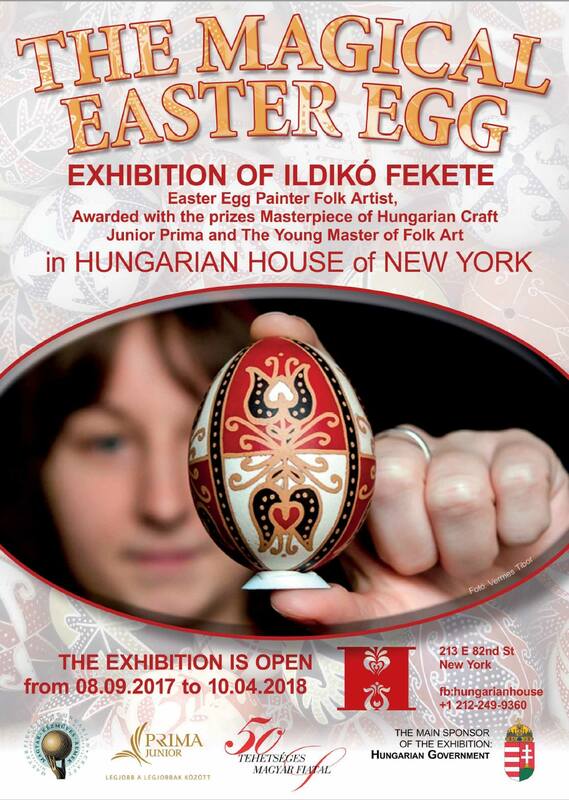 In 2010, Kakas published the results of his endeavours in a volume entitled The Traditional Decorated Eggs of Háromszék. 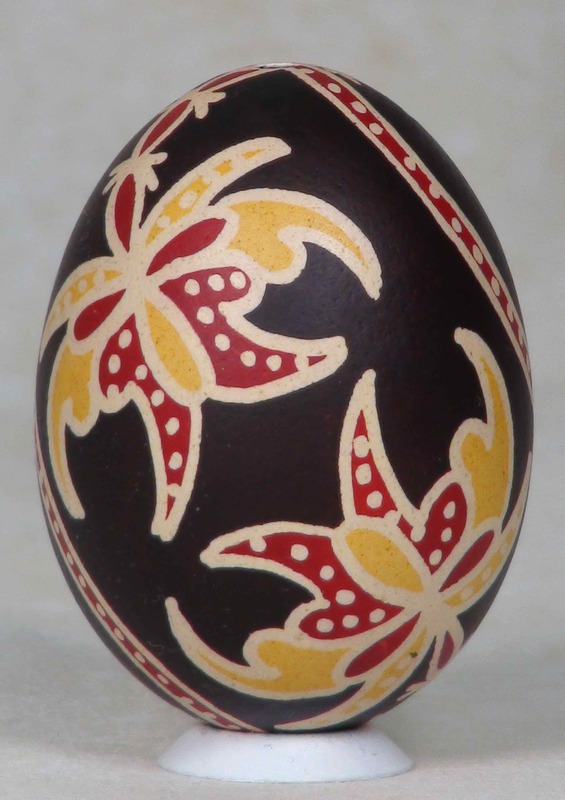 Within the craft as a whole, the eggs of Háromszék are highly distinctive in terms of both pattern, and colouring technique. Most of the designs feature botanical motifs, which – unlike those of other regions – tend to run not from tip-to-tip, but around the egg in the horizontal direction. Of the two techniques used most often, the first involves dividing the shell into four equal fields by means of one vertical and one horizontal circle, then decorating each with a leaf or tulip motif oriented in the direction opposite that of its neighbours. In the second, the shell is divided by a single, vertical circle into two regions, then a partial horizontal line drawn to form the stem of a central flower motif, leaving enough space between the endpoints and vertical line for the head of the flower, usually a tulip, or other, similar design. Emerging from this central stem are two additional shoots, one proceeding upward toward the top of the egg, and the second mirroring the first in the downward direction. In the interest of symmetry, each shoot terminates in a bud or flower identical to that of the central motif. It is not unusual, however, for a Háromszék artisan to ignore considerations of symmetry and fill the upper region with a star pattern to contrast the botanical motif of the lower field. The colorations that typify Háromszék egg painting range from plain red to multi-coloured designs in yellow, red, and black. It is not the colours themselves that are of interest, however, but the manner in which they are applied. In other regions with a tradition for multi-coloured eggs, application of the pattern is followed by a colouring of each region from one contour line to another. 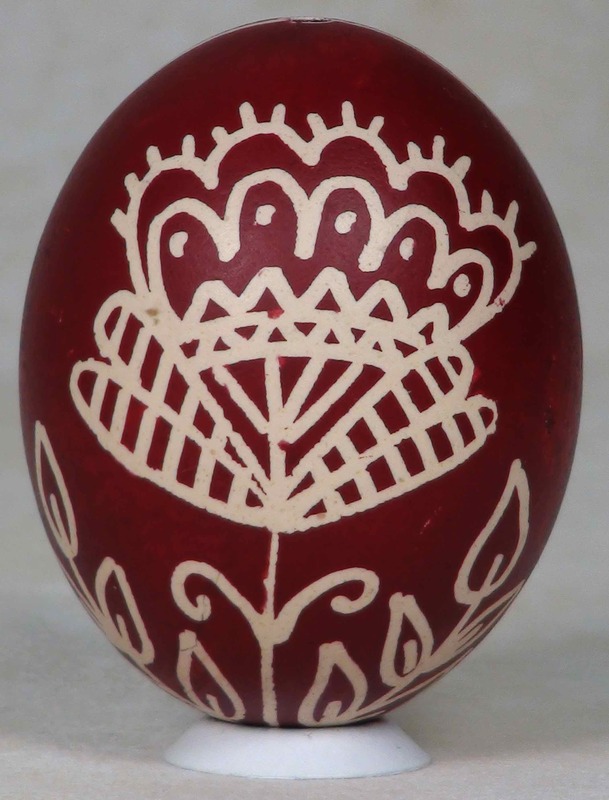 In Háromszék, however, only a small portion of the unpainted egg – the centre of the tulip, for example – is prepared with the desired pattern. Other parts are drawn on during the decorating process, each in a different colour. Another frequent technique is the outlining of a design drawn on in white with another colour, such as yellow or red. In addition, in colouring in a flower, for example, the colorant may be applied so as to extend beyond contour lines, resulting in an effect that might appear odd or sloppy. This seeming imprecision is, however, deliberate and is one of the features that distinguishes the Háromszék tradition as special. 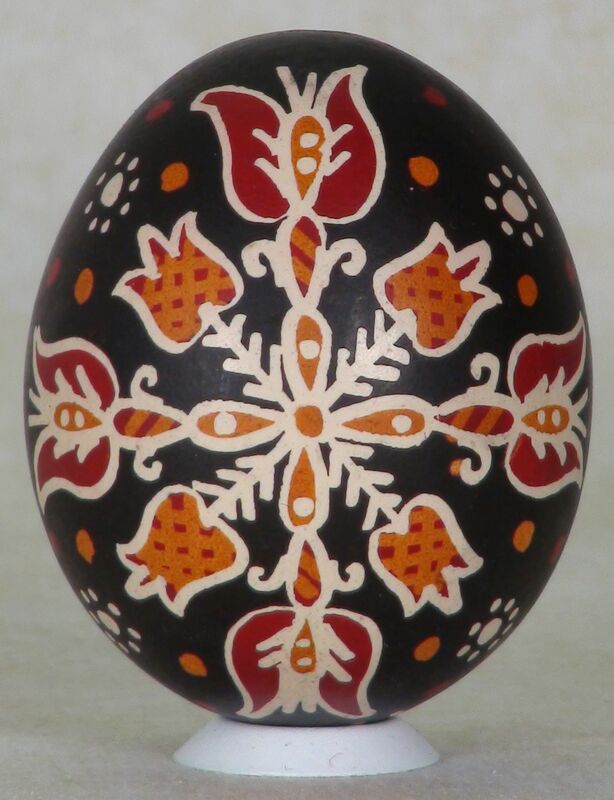 Long ago, traditional egg-painting motifs were preserved from year to year in the memories of the artisans who used them; today, the styles of different regions are recorded in books, the most thoroughly studied being those of the region of Gyimes in the Eastern Carpathians. The first category includes the designs known as “white cabala,” “devil’s knee,” holy cross, and “Jesus’ heart”. “White cabala,” for example, is done without partitioning the surface of the egg. In regional dialect, “cabala” means “mare,” a white mare being a sacrificial animal to the Csángó, and the ancestral animal of the Székely, who sacrificed white mares to the Sun. The “devil’s knee” is the symbol for a human who makes a pact with the forces of evil. At first, such a person could expect all to go well, that is, until his or her work was done, at which point the devil would carry his earthly servant back with him to Hell to labour for his soul there. Designs featuring depictions of tools centred most often on the theme of agriculture, with ploughs and rakes serving as symbols of fertility, and of the bringing of Mother Earth to fruit. The star, the focus of a class of patterns belonging to the third group, symbolises the circle of life, and indeed, it was believed in some places that the birth of a child was accompanied by the appearance of a star in the sky, whose light was then extinguished when the individual died. Also belonging to this group is one of the most ancient motifs known to the craft, the “wayward path,” manifested in the form of a meandering line. In fact, two different sets of beliefs surround the design. The first holds that the motif protects its owner from becoming lost or assists in returning home to family as quickly as possible. For this reason, it was often given to travellers or merchants. Elsewhere, it was said that the “wayward path” created a link between this world and the one beyond, enabling the spirits to travel back and forth at will. The spirits, for their part, enjoyed entering the realm of the living, where they frightened people with their hoots and wails. Despite this, egg decorating commenced each year with the production of a wayward path, which was also the road by which spring arrived. An appreciable number of Gyimes motifs involve the images of humans and animals. In the past, every major family or dynasty in the region traced its roots to some ancestral animal. If merely the most suggestive part of the animal were painted on an egg, it was believed, the creature would rise again to protect living members of the family. Thus, ancestral designs served the purposes of averting danger and warding off evil magic. It is probable that botanical designs emerged within the craft only later, when the meanings of the more ancient motifs had begun to fade from memory. As many depictions were too abstract for unequivocal identification, and their names, too, had been forgotten, they were gradually refashioned to depict flowers, vines, or decorative hearts. Muravidék is the northernmost historical region of Slovenia, which prior to the Treaty of Trianon, formed part of the Kingdom of Hungary. 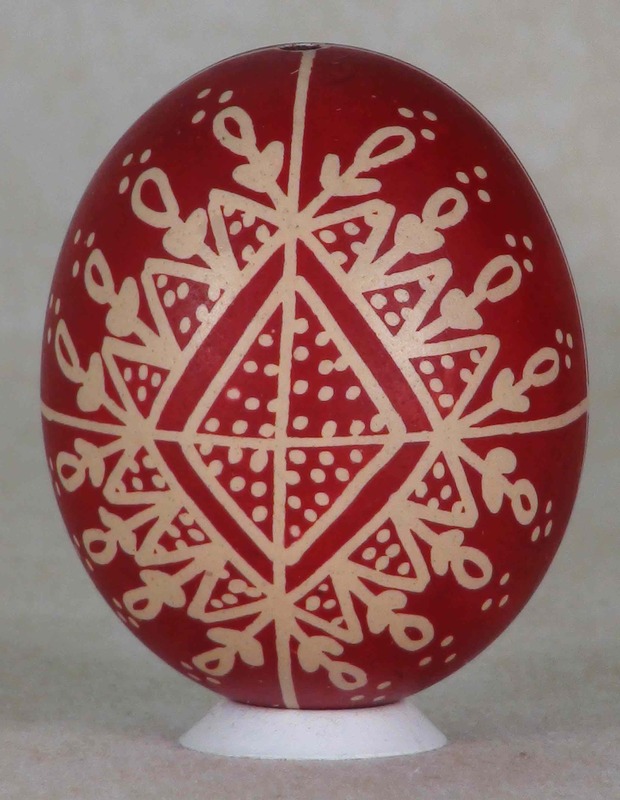 In anticipation of Easter, Muravidék artisans drew designs on eggs using sticks of various lengths dipped in hot wax. The somewhat unrefined lines that resulted were a peculiarity of the region. Although the designs used were neither great in number, nor rich in detail, some are quite interesting and unique to the region. The eggs of Petesháza are particularly distinctive, for example, though the motifs involved are so old that neither their names, nor their original meanings are remembered. Two are said by locals to represent the crosses of the village and fields. Suriving information as to how the eggs were decorated is scanty. 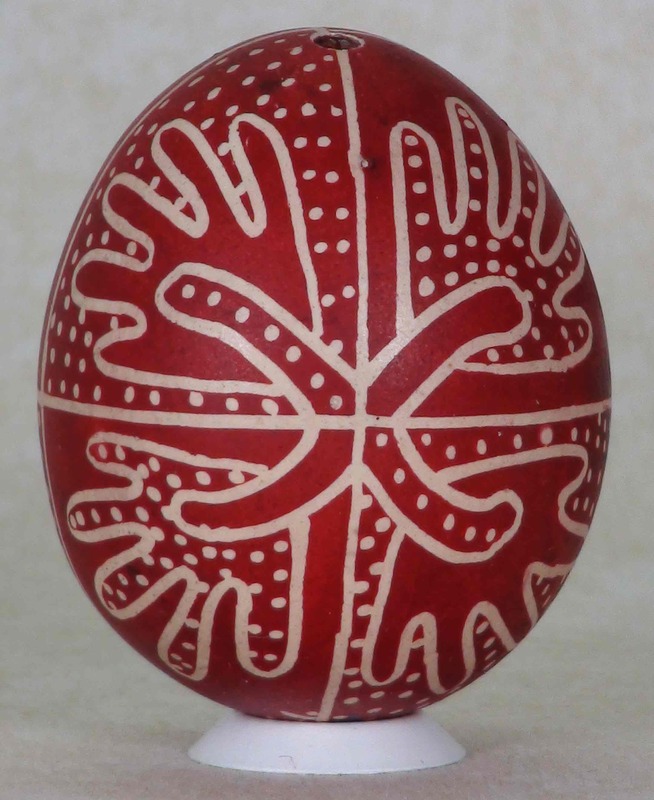 First, the wax-patterned eggs were placed in a red dye made from soaked crepe paper. Next, further sections of the design were covered in wax, and the eggs dyed black, using a pigment made from the bark of the black alder. The prettiest eggs were given by godparents to their godchildren on Easter Sunday. Those deemed imperfect went to the household’s own children. The deftest craftswomen even made eggs to order. Today, painted Easter eggs are produced only in the tiny village of Dobronak, though as the local Hungarian population has taken great pains to preserve its traditional culture, this exquisite craft is at present experiencing something of a Renaissance. In Upper Hungary, flowers are a preferred motif for decorated eggs. In some instances, only the head of the flower is drawn, though flowers with stems are also common, in which case the motif departs from the bottom of the egg, opening upward until it reaches the very top. Here, the motif represents not a simple flower, but a tree of life, the egg symbolising the world, its lower section the ground, and the upper section the sky. A tulip was often used for this purpose, or at times even a rake embellished with leaves and tendrils. In this region, too, patterns were drawn on in wax, though using a variation on the stylus method involving a simple, thin stick. Since the wax did not flow from a hollow tip, as with a stylus, the lines were of an uneven quality, starting out thicker, then tapering off as the wax adhering to the tip of the stick was gradually consumed. The technique was therefore only suited to very simple patterns. Another of the region’s more interesting folk customs, known as “suprikálás,” involved “whipping” the boys performing the Hungarian tradition of splashing water on girls at Eastertime. On the Tuesday after Easter (and in some places until the end of the week), girls and married women performed the reciprocal custom of “watering” their menfolk in the same way. Here, as in most of Transdanubia, Easter eggs are dyed red and no other colour. One common method of decoration involves dividing the egg into eight partitions. Another places a single dividing line between two motifs. More ornate specimens feature dividing lines that are themselves decorated, though minimally, and indeed, it is not only the motifs that bear names in this region, but the lines that separate them, as well. The egg patterns of Váralja and Pécsvárad are simple and rarely dense or overly ornate. Even the quantity of dots used is kept at a minimum. 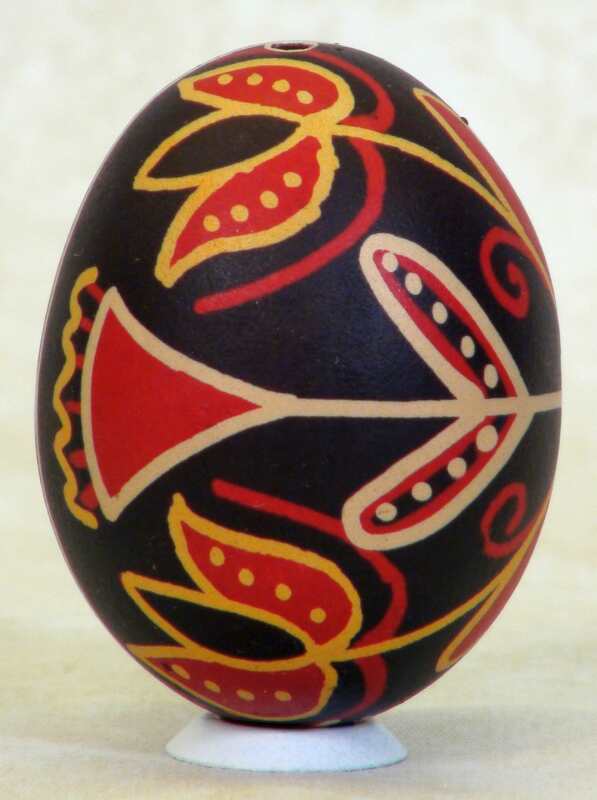 In addition, some eggs feature hash lines in place of a dot motif (a technique also used in Muravidék, though to a more prodigious extent). The range of patterns characterising these municipalities includes some, such as the “kantáros” (the word “kantár” meaning strap, rein, or ribbon), that are found throughout Transdanubia and among the Gyimes Csangó. Others, however, are unique to the area. The egg patterns of Váralja are frequently arranged about five axes of symmetry, unlike patterns found elsewhere, which universally favour a symmetry built around divisions of two or four. Most of these represent flowers formed by adding embellishments to the five-pointed star pattern. Also quite frequent are designs based on triaxial symmetry, though these are not exclusive to the area, appearing, for example, among the Csángó, as well. Most common of all are flower patterns, which here are simply drawn and frequently divided into groups of three. Patterns depicting animals typically feature some distinctive part of the animal’s body, such as the sheep’s (wether’s) horn, bear’s paw, devil’s knee, or frog’s rump. Very rarely, the full animal is drawn, a phenomenon also encountered in Sárköz, though nowhere else (at least in recognisable form). The designs of Váralja and Pécsvárad, however, even include fully formed birds, though oddly, the name for the style refers to them not as birds, but as dogs. The festive eggs of Felső-Torontál (Upper Torontál) County are produced in a handful of municipalities in the vicinity of Szeged and Szerbkeresztúr. Though the professional literature tends to view them as Serbian in origin, some experts have regarded them as Hungarian. Unfortunately, as the notion of Serbian heritage has largely prevented their study and documentation by Hungarian scholars, we are left with few resources on which to base an opinion. Today, only a small number of local artisans still engage in their production. Eggs from this area are easily recognised both by their colours – red, black, yellow, and occasionally white – and by their distinctive motifs. The most frequent combination features red and yellow designs on a black background, with red backgrounds encountered more rarely. Yellow is never used as the background colour for an entire egg, but may be used as the background colur for a part of the design. A somewhat larger number feature white as a background colour, though in this case, no yellow is used in any part of the work. Károly Cs. Sebestyén, who conducted ethnographic collecting work in the region during the early part of the past century, claimed that of the few surviving design names, most contained references to flowers, a fitting circumstance, as the larger part of Upper Torontál egg patterns were in fact floral in character – though he also noted that such names were probably later appellations and therefore did not include a detailed account of them in his study, nor is the subject treated in any other resource. Standing out among this array of floral motifs are “the fish,” a design that in fact resembles nothing of the sort, and “the star,” interesting in that its lines are drawn in a manner atypical of the region. Indeed, with its five points and straight edges, “the star” adheres precisely to the examples commonly seen elsewhere Hungary. Upper Torontál egg patterns also include a rich selection of dividing elements, or “belts”. Though some eggs are partitioned with simple lines, others feature decoratively filled double lines, chains formed using combinations of the two basic elements, or even belts of tulips. Such divisions could be placed vertically, horizontally, diagonally, or any other direction the maker desired.